Happy Saturday! I planned to do a haul post today but the weather fairies conspired against me for the last several days and decided to bring the rain (and with it bad lighting). So instead I'm doing a easy breezy swatch. Eh? Say what! I know I know. I did plan on doing a little "more" but again the lighting situation wasn't good. In fact, I'm so annoyed that I'm already trying to either build or buy my own lightbox so that I won't be quite so limited in the future. 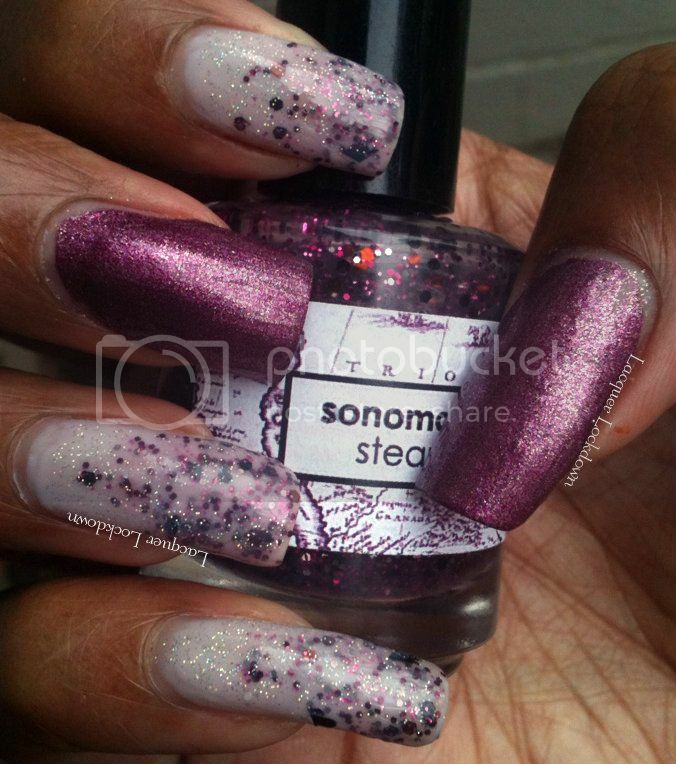 That said let's talk about a brand that I absolutely freaking love - Sonoma Nail Art! Sparkles all around. I really wish I had been able to get a few photos in sunlight to show off the holographic topcoat a bit more. These were all taken in indirect sunlight/rainy weather. First, you need to check out her blog - start there because her nail art is SICKENING! Ok have you recovered yet? Now check out her polishes. I know you almost died of a polish-gasm didn't you? Flawless flawless glitterbombs with formula that makes it totally worth your while. I want them all! But for today let's settle for Steampunk. 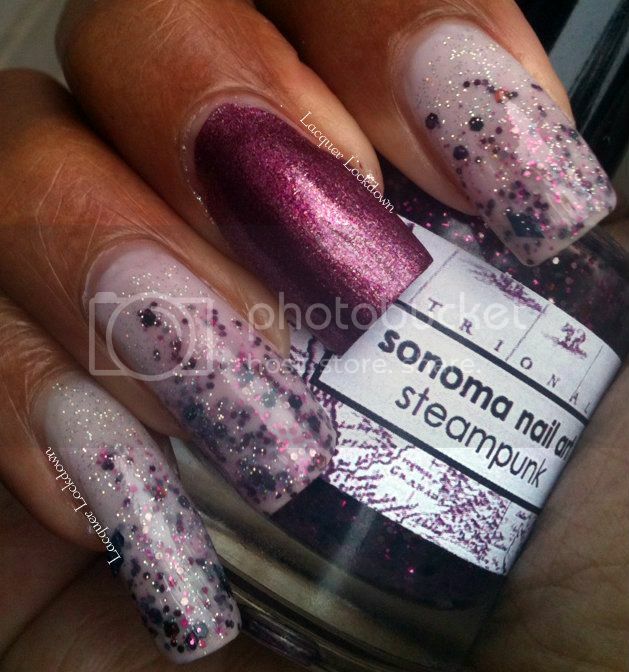 Steampunk is a glitter polish with black diamonds and an assortment of magenta and rust colored glitter in a dusty pink base. Translation - purrty! Two coats of Care To Danse? 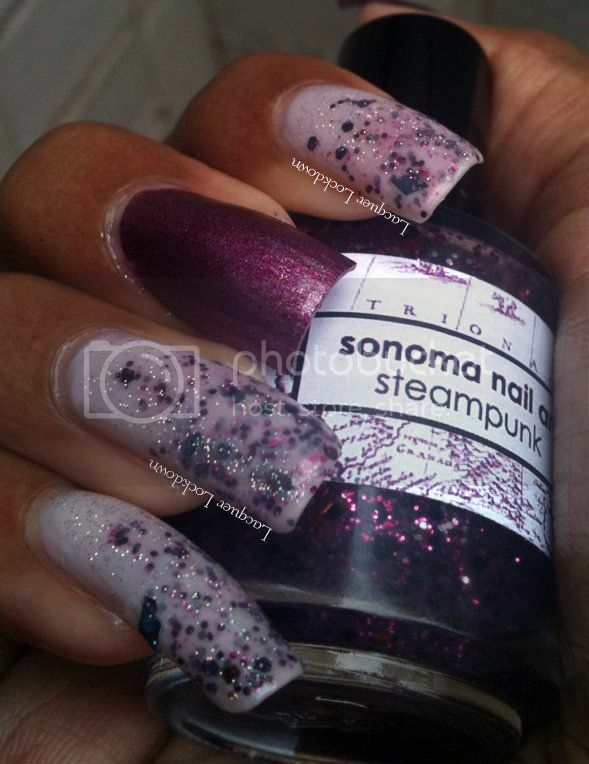 + one coat of SNA Steampunk +one coat of CTD?+ one coat of Fairy Dust = yummy jelly. I decided to wear it as a glitter gradient layered in a jelly sandwich using OPI's Care To Danse? from their NYC Ballet Collection. I also added a single swipe of China Glaze Fairy Dust to the entire nail. For accents I painted my nails using OPI's We'll Always Have Paris (Suede). I found the final effect to be stare inducing. Gooey looking in the best way - this is why I love jellies! hey - who you calling a polished prisoner!? i'm no slave to my polish! Lol m'dear I've seen your blog. I know - you are and it's okay to admit that here in this space. I won't pass judgement I promise :) Hahaha and thank you kindly!